State Bank of India is going to conduct Clerical Cadre examination on various dates in July-August 2014. The application submission process is over on 14 June 2014. Now State Bank of India is planning to release admit cards for the clerical examination. The latest news is that SBI Clerk 2014 Admit Card is soon going to be available on the official website. For the actual date of release of SBI Clerk admit card 2014, please read the below given information. State Bank of India is going to release Admit Card for Clerk exam on 09 July 2014. When it became available, MeriView.in will display it here. All those candidates who have applied for this recruitment can download their admit card from 09 July 2014 onwards. All the details regarding SBI Clerk Exam Date, centre of examination, roll number, time etc. will be mentioned on the SBI Clerk hall ticket/admit card. To download the admit card for SBI Clerk Exam, candidates need to follow the procedure given below. 1. Visit SBI official website www.sbi.co.in. 2. Click on Recruitment link provided on left side of sbi.co.in website. 3. 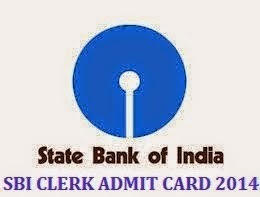 Choose the link which says like SBI Clerk Admit Card 2014. 4. On the following page, enter your registration number and password or DOB and click submit. 5. Your SBI Clerk Admit Card 2014 will be displayed on the screen. Save a copy of it and print it. Remember to carry it at the time of your examination. Those candidates, who opt for pre-examination training, can download their Call Letters for training after 30 June 2014. So candidates need to wait till 09 July 2014 when the Admit Card for SBI Clerk 2014 Exam will be released. We are keeping a close eye on when it will be released so that you will be notified first by MeriView.in. Meanwhile it is time to prepare better for this examination. We have provided Syllabus of SBI Clerk exam as well as numerous Shortcut Tricks which you will be able to find by clicking on TRICKS link on main menu. So friends stay updated with this blog..